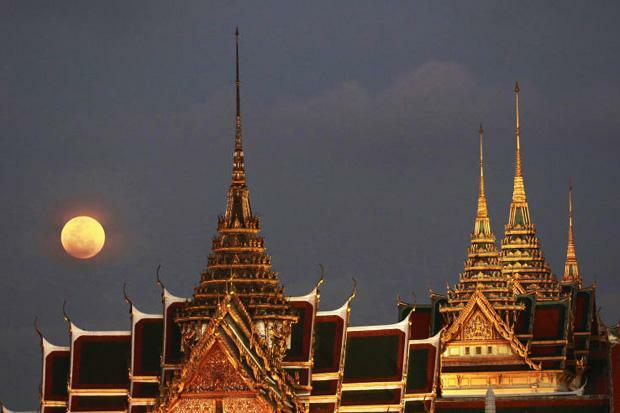 Amateurs and professional stargazers in Thailand joined people in several parts of the world to watch the rare "Super Blue Blood Moon" on Wednesday night. The phenomenon began at 6.30am in Thailand with the total eclipse occurring between 7.51pm and 9.07pm in the kingdom, according to the National Astronomical Research Institute of Thailand (Narit). Cloudy sky, however, obstructed visibilit y in some areas, including Khon Kaen where people could see the blue moon for about five minutes before it was obscured. "Despite the cloudy evening, the moon was seen at 6.45pm on the dot. It was really beautiful," said Suksan Karnsa-ard, a science teacher at Kaennakhon Witthayalai School, where a telescope was available for residents to experience the event. In Buri Ram, the total eclipse was visible in Muang district and a few fireworks were set off in a nearby village, with people on passing motorcycles beeping their horns. 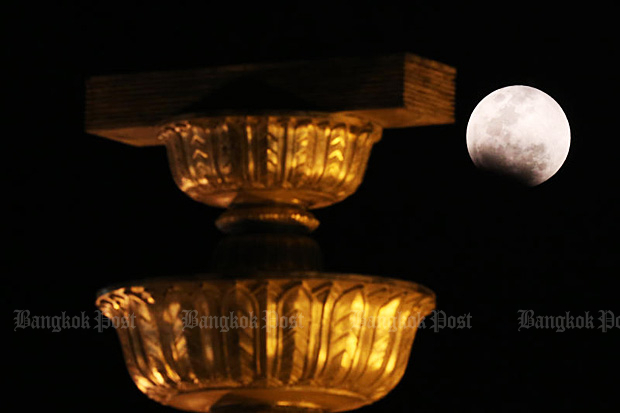 Narit executive director Saran Poshyachinda said the moon on Wednesday was larger than normal because of a "perigee", its closest approach to Earth in a single orbit. Everybody could see the lunar eclipse with their own unaided vision, he added. The extreme east of Africa, the Middle East and Asia, Russia, Australia and New Zealand are all able to enjoy the spectacle as the moon rises there on Wednesday night. People in Hawaii, Australia and eastern Asia should be able to follow the full eclipse from beginning to end, said the National Aeronautics and Space Administration. The last "Super Blue Blood Moon" occurred on Dec 30, 1982, when it was seen in Europe, Africa and western Asia. For North America, the last time was in 1866. But most of South America, Africa and Europe, where the alignment occurs in the middle of the day, will miss out on the show. The celestial show is the result of the sun, earth, and moon lining up perfectly for a lunar eclipse just as the moon is near its closest orbit point to Earth, making it appear "super" large. It is the second full moon within the same month, a phenomenon called a " blue" moon which has nothing to do with its colour. The "blood" in the name comes from the reddish brown colour the moon takes on when Earth enters between it and the sun, cutting off the light rays that usually brighten the lunar surface. If you miss this one, the next blue moon total lunar eclipse will happen on Dec 31, 2028, though it won't be quite as large since it will not be as close to Earth. Another will occur on Jan 31, 2037. "The red colour during a lunar eclipse is very distinctive and it's a rare treat to be able to see a blood red moon," said Brian Rachford, associate professor of physics at the Embry-Riddle Aeronautical University.